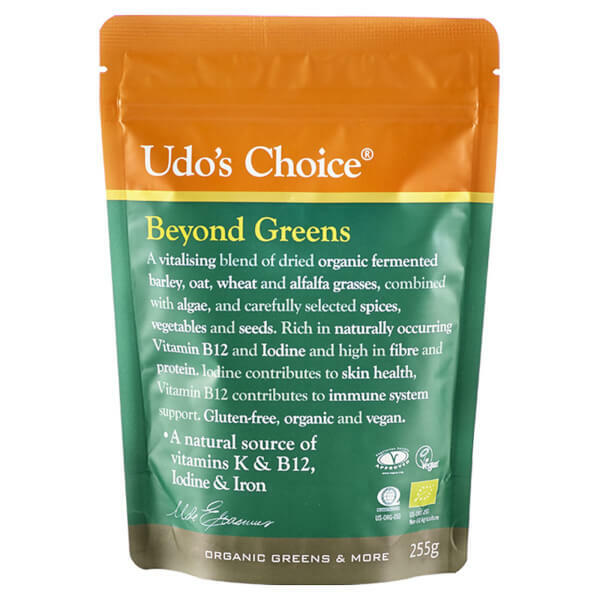 Udo's Choice Organic Beyond Greens is a science-based health supplement bursting with antioxidants and vitamins. Super rich in fibre and protein, the new formula is a nutritious blend of certified organic greens including vegetables, fermented grasses, superfood algae and seaweeds. 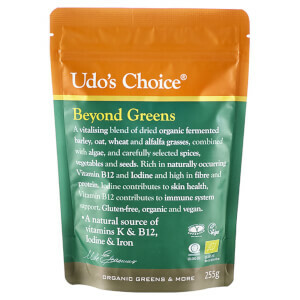 Free from dairy, yeast, soy and genetically modified ingredients, an 8g tablespoon provides the equivalent of two servings of organic vegetables and is a source of Vitamins K, B12, Iron and Iodine. Presented in a re-sealable zip lock pouch for convenience and freshness, it’s a super easy way to get in your recommended daily vegetables. Mix 1 scoop (8 g) as desired with a glass of water or add to a smoothie for added nutrient value. Fermented grass blend* (barley grass*, oat grass*, wheat grass*, alfalfa grass*, Lactobacillus plantarum, Saccharomyces boulardii, and molasses*), alfalfa herb*, barley grass*, defatted flax seed*, oat grass*, rye grass*, broccoli*, ginger root*, chlorella*, dulse*, licorice root*, spirulina*, kale leaf*, defatted sunflower seed*, cinnamon bark*, and defatted sesame seed*, natural flavours (almond and vanilla), *Organic.